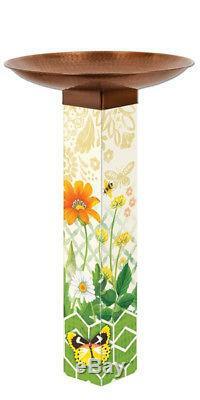 Give birds a place to refresh and rejuventate with this beautiful Bird Bath Art Pole. The copper-plated stainless steel top is hand-hammered in India. The durable, all-weather, fade-resistant base is made in the USA. No digging required for installation. The item "Studio M Daisy Garden Bird Bath Art Pole" is in sale since Sunday, November 4, 2018. This item is in the category "Home & Garden\Yard, Garden & Outdoor Living\Bird & Wildlife Accessories\Birdbaths". The seller is "afoodieaffair" and is located in Salem, New Hampshire. This item can be shipped to United States.